Home > Ministry of Road Transport > Centre to contribute Rs. 1 lakh Crore for the development of road infrastructure in Karnataka. The Central Government will contribute Rs one lakh crore for the development of road infrastructure in Karnataka. In addition Rs. 200 crore will be spent on developing four light houses in the state in PPP mode. Shri Nitin Gadkari, Union Minister for Road Transport& Highways and Shipping has assured that the Government of India will extend all support to the Government of Karnataka for the development of infrastructure in the state. Shri Gadkari was speaking at the inaugural function of Invest Karnataka -2016, a three day global investors meet organised by the Karnataka Government in Bengaluru today. He said that road projects worth Rs.60,000 crore will be started in Karnataka before December this year and projects worth another Rs 40,000 crore will be taken up next year. Talking about the traffic problem of Bangalore city, Shri. Gadkari said that he will hold a meeting with the Transport Minister of Karnataka today to come out with some solution . 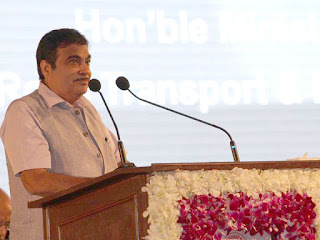 Shri Gadkari further said that the capacity of the New Mangalore Port will be doubled with a development project of Rs. 10,000 crore. He said that the approach of the government is to attract more investments by which more number of jobs can be created and poverty can be eliminated. The Government of India under the able leadership of Prime Minister Shri. Narendra Modi is working as ‘Team India’ in realizing the vision of ‘Sabka Saath Sabka Vikas’ the minister added.